Situated in the historic village of Caerleon, yet off the beaten track, our family run Bed & Breakfast provides an ideal base to explore Caerleon and the surrounding area. Attractions, a few minutes walk from here, include the Roman Amphitheatre, Barracks and Baths - and the National Roman Legion Museum. The village is also the birthplace of Arthur Machen (noted Author) and there are a range of pubs and restaurants nearby. Further afield (approximately an hour or less by car) are the cities of Cardiff, Bristol and Hereford, the Forest of Dean, Barry Island, Monmouth & Abergavenny as well as Tintern Abbey and Hay-on-Wye. St Fagan's National History Museum and the Big Pit National Coal Museum are also within easy reach. Caerleon provides an ideal base for a range of sights, attractions and events and is conveniently situated near a major road network. 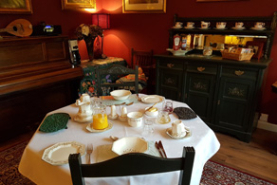 We provide: a full cooked breakfast (free range, and locally sourced where possible); Continental and Vegetarian breakfast options; secure off-road parking in our own grounds; and free Wi-Fi internet access. We are open all year round and Brian & Christabel look forward to providing you with a pleasant place to stay, whether on holiday or business. N.B. : All accommodation is on the first floor and the house is reached by a set of steps from the car park.